The last two decades have not been kind to the white potato. While sweet potatoes have been given the title of being a superfood, white potatoes have been cast aside by many fad diets (Atkins, South Beach, GI, and the more recent Paleo to name a few) and given a bad rap. So what are the differences between these tubers? 1. Potatoes and sweet potatoes are not part of the same family of tubers. Potatoes are a member of the Solanacae family, and are stem tubers. Sweet potatoes are a member of the Convolvulaceae family, and are root tubers. Note: Yams and sweet potatoes are not part of the same family. Yams are part of the Dioscorea family of tubers, but are also root tubers. 2. Potatoes have a higher Glycemic Index (GI) than sweet potatoes. Technically this statement is true. The GI of both potatoes and sweet potatoes changes depending on cooking method. Boiling tubers produces a lower GI than baking them. However, the tables are turned when Glycemic Load (GL) is taken into account. GI is a measurement of carbohydrate quality, while GL measures quantity and quality. GL is determined by multiplying the amount of carbohydrate (quantity) by the glycemic index (quality) of that food. The value is then divided by 100. High GL carbohydrates produce a greater elevation in blood glucose and thus, greater insulin response. 3. Sweet potatoes are an excellent source of vitamin A.
Vitamin A is a fat soluble vitamin that is important for vision, immune function, and organ function. One sweet potato will provide adequate vitamin A to meet the Recommended Nutrient Intake for the day. 4. Differences aside, both tubers are high in potassium and fibre, and comparable in macronutrient values. In conclusion, both tubers are nutrient dense carbohydrates that can be part of any healthy diet! Preheat oven to 400 degrees F. Pierce holes on both sides of the potatoes and place directly on the oven rack. Bake for 60 minutes. While potatoes are baking, chop broccoli floret into pieces. Spread evenly on a baking sheet and toss with olive oil and black pepper. When the potatoes have 15 minutes of baking time remaining, put broccoli in oven. Remove both potatoes and broccoli and set the broccoli aside. Slice the potatoes in half lengthwise cautiously, as potatoes will be very hot. Loosen the inside of the potato with a fork and place on baking sheet. 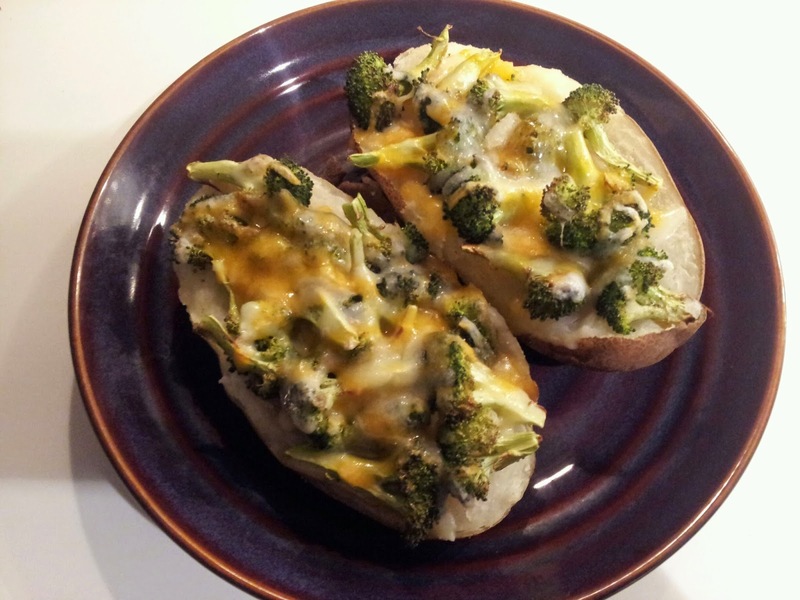 Top with broccoli and cheddar and return to oven for 5 minutes to melt the cheese.